This is a real quick and easy starter, eat warm straight out of the steamer but they are also great served cold. If you like them spicy add an extra drop of tabasco on each mussel. The bacon should be extra crispy and crunchy. Over low heat sweat the diced onion in olive oil in a pot. Cook until translucent and tender. In another pan, fry the bacon crispy and drain on a paper towel. Combine tomato sauce, worcestershire and tabasco, in a bowl fold through the onions, season with sea salt. De-beard and scrub the mussels, then steam for 7 minutes or until they open. 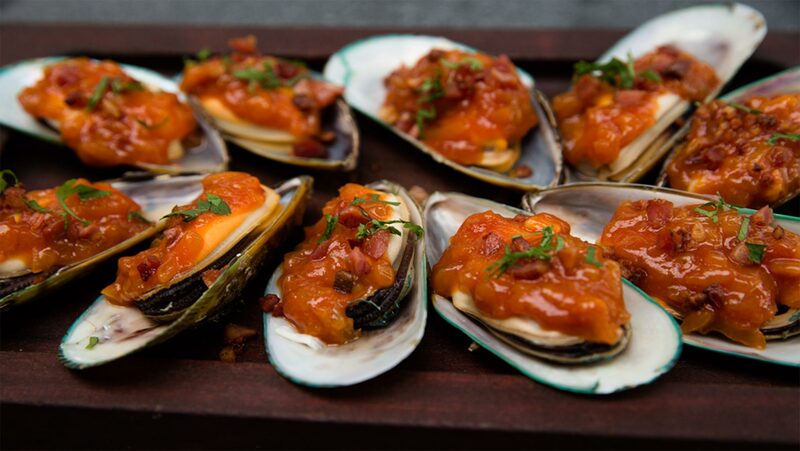 Dislodge the mussels and check for beards or crabs, then keep the mussels in half of their shell, dress with tomato sauce, and garnish with crispy bacon and parsley.